Benozzo Gozzoli (c. 1421 – 1497) was an Italian Renaissance painter from Florence. 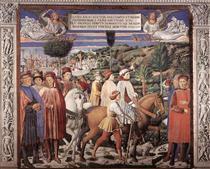 He is best known for a series of murals in the Magi Chapel of the Palazzo Medici-Riccardi, depicting festive, vibrant processions with fine attention to detail and a pronounced International Gothic influence. 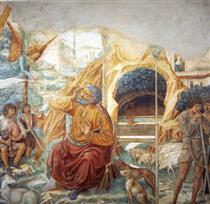 The chapel's fresco cycle reveals a new Renaissance interest in nature with its realistic depiction of landscapes and vivid human portraits. 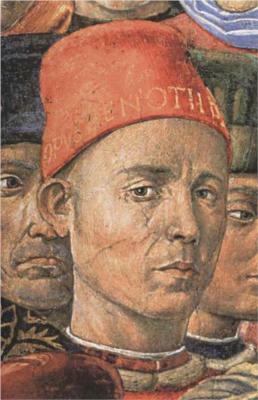 Gozzoli is considered one of the most prolific fresco painters of his generation. 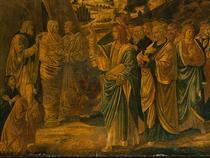 While he was mainly active in Tuscany, he also worked in Umbria and Rome. 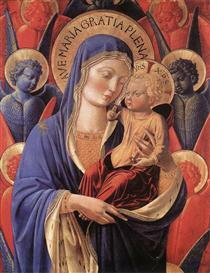 Gozzoli was born Benozzo di Lese, son of a tailor, in the village of Sant'Ilario a Colombano around 1421. His family moved to nearby Florence in 1427. According to the 16th century Italian biographer Giorgio Vasari, Gozzoli was a pupil and assistant of Fra Angelico in the early part of his career. 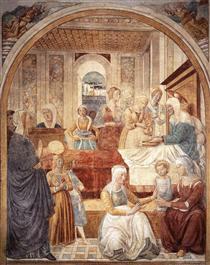 In this role, Gozzoli assisted Angelico in the execution of fresco decorations in the dormitory cells of the Convent of San Marco in Florence. Established contributions here include The Adoration of the Magi in Cosimo de' Medici's cell and the Women at the Tomb in a larger depiction of the Resurrection of Christ in cell 8. 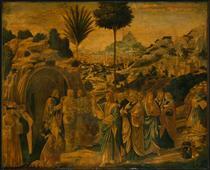 Like many other Early Renaissance painters, Benozzo was initially trained as a goldsmith as well as a painter. Between 1444 and 1447, he was therefore able to collaborate with Lorenzo Ghiberti on the famous Gates of Paradise of the Florence Baptistery. 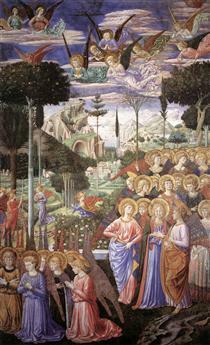 On May 23, 1447, Benozzo was with Fra Angelico in Rome, to where they were called by Pope Eugene IV to carry out fresco decorations in a chapel in the Vatican Palace. This chapel was later demolished, so nothing of these works remains. 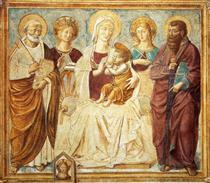 He then accompanied Angelico to Umbria, where they decorated a chapel vault in the Orvieto Cathedral. Due to political complications in the city, they completed only two of the four vault webs and were again summoned to the Vatican. There, the pair worked for Nicholas V in the Niccoline Chapel until June 1448. 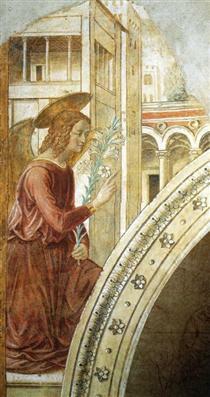 Gozzoli is assumed to have made significant contributions in the chapel's frescoes. Furthermore, a 1449 Madonna and Child Giving Blessings in the church of Santa Maria sopra Minerva was painted by Gozzoli and perhaps designed by Angelico. 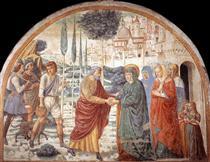 In Rome, Gozzoli also executed a fresco of St Anthony of Padua in the Basilica of Santa Maria in Aracoeli. 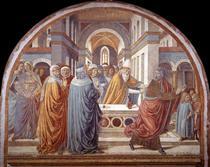 Both Fra Angelico and Lorenzo Ghiberti were to influence much of Gozzoli's work for the rest of his life. From Ghiberti he learned precision in depicting the finest details and how to illustrate a story vividly, while from Fra Angelico, he took his bright color palette, transferring it to the art of fresco painting. 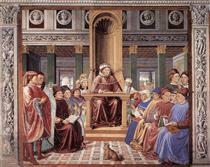 In 1449, Gozzoli left Angelico and moved to Umbria. 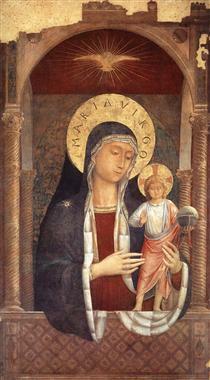 In the hilltown of Narni there is an Annunciation from 1450, signed OPU[S] BENOTDE FLORENT[IA]. 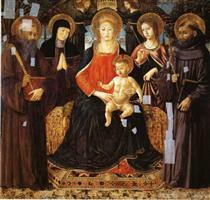 In the monastery of San Fortunato, near Montefalco, Gozzoli painted a Madonna and Child between St. Francis and St. Bernardine of Siena, and three other works. 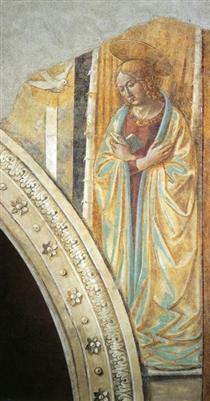 One of these, the altarpiece Madonna of the Girdle, is now in the Vatican Museums and shows the affinity of Benozzo's early style to Angelico's.